Question: How likely is it that the earth will be hit by a meteor? Asked by lucasjacobs to Meeks, Pete, Stephen, Steve, Tom on 25 Jun 2010 in Categories: General. Extremely likely – it’s been hit many times in the past and is likely to be hit again in the future. In fact, it’s probably a daily event though, thankfully, most of the time the meteorites burn up before they reach the ground. Let’s hope we can figure out how to deflect the big ones before the next one comes along. According to Brian Cox’s ‘Wonders of the Universe’, a lot of earth bound meteorites are due to the effect of Jupiter on the nearby asteroid belt. It’s pretty much guaranteed that we will be hit by a large meteor in the future. The history of the planet tells us that small objects frequently collide with the Earth. According to Wiki asteroids with a 1 km diameter strike the Earth every 500,000 years on average. Large collisions – with 5 km diameter objects – happen approximately once every ten million years. 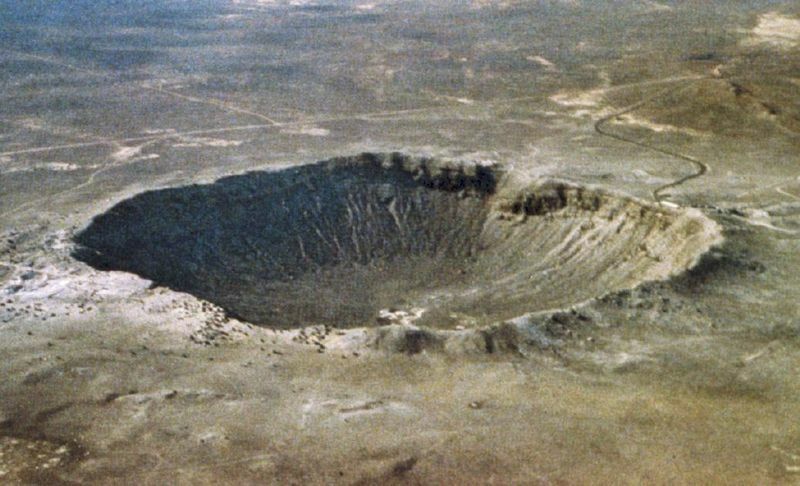 The last known impact of an object of 10 km or more in diameter was at the Cretaceous-Tertiary extinction event 65 million years ago. It is certain that the Earth will be hit by space rocks in the future. This happens all the time. If you look at the surface of the moon you will get some idea how common these occurrences are. This is one of my favourite questions, because I spent quite a bit of time finding out an accurate and more detailed answer. It turns out that probability of being hit by an asteroid depends on the size of the object. Big ones come along much less often. Which tells you how many objects of a given size D (in meters) are expected to hit the earth in a year. It’s hard to put the equation clearly in plain text (on this page) but you could easily work out the answer with a calculator. Take the size in meters (say “3”) then press the “x^y” button. Then type “2.7” and press the “+/-” button. Then press “=” multiply the answer by 37. I make the number of 3m or smaller impacts in a year to be 1.9. So every year around two 3m objects hit. Looking at the original Nature paper about this it looks as if when they hit they would go off with the force of several (2-6) thousand tons of TNT. For comparison the bomb that destroyed the Japanese city of Hiroshima in WW2 had a yield equivalent to about 15 thousand tons of TNT. I hope I didn’t make any mistakes with the “power law” equation or the instructions above, but I think I may have (or wikipedia is wrong). The reason why I took along time over the answer, is that when I checked my calculations they didn’t agree with the graph in the original paper (which is great, even I could understand it – nearly). Look at Figure 3 – it shows the relationship between size of object (diameter), size of “explosion” (Bolide energy) and number hitting the earth every year. The object that wiped out the dinosaurs (if the theory is correct) made the Chicxulub crater in Mexico. It is (according again to wikipedia) estimated to have been 10km in diameter and detonated with the force of 100 million tons of TNT.